Remember when Erica Durance joined Smallville as Lois Lane that the show got like 100% way better. 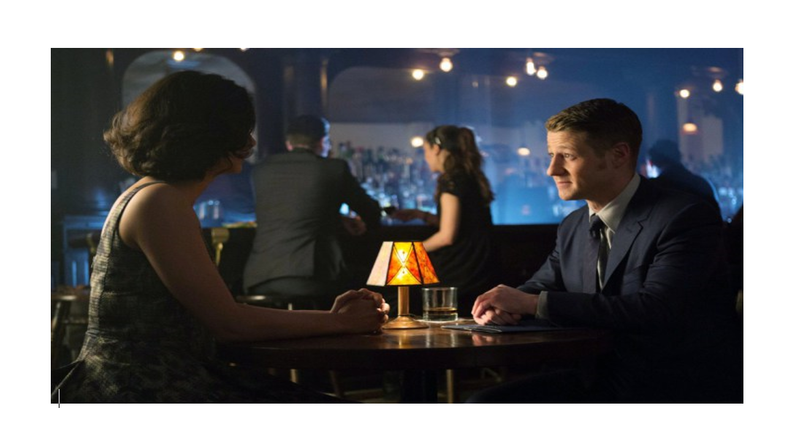 I am getting the same vibe off of Morena Baccarin joining Gotham as Leslie Thompkins. Lois brought much needed humour to Smallville and totally got Clark to lighten up whenever she was around. While Leslie isn’t providing comic relief, she is making Jim Gordon less of a stuffed shirt. But tonight’s episode as part 1 of a two parter that introduces the future Scarecrow aka Jonathan Crane. In this iteration, he is a young teen and it is dad, the titular Dr. Crane (Julian Sands) that is the villain tonight. If Dr. Todd Crane looks familiar to you, if you are a fan of Smallville then you will recognize him as playing Jor-El in season 9 and 10. Also, I know Sands from A Room with a View. Gordon has returned to Barbara’s apartment to return her keys but instead of finding Barbara, he encounters Selina has has been staying there as an alternative to the street. Gordon promises to take her somewhere safe to stay as she is still a witness to the Wayne murders. Selina realizes that Gordon hasn’t been to see Bruce in a while so tells him that she lied about being a witness. Before Gordon can question her further. Selina jumps from the balcony and slips away. The gist of Gordon’s meeting with Bruce is that Bruce knows that Selina lied despite Gordon saying that Selina is probably afraid. Also, Bruce pretty much fired Gordon from his parents case and will find the killer on his own. Penguin and Maroni are raising a glass of champagne for taking down Fish Mooney, which means Falcone needs to scramble to regain her territory. Penguin tells Maroni that he took the liberty of taking over Fish’s nightclub. This surprises Maroni at first but tells him it was good thinking. Maroni then gets a phone call and it is Fish on the other end. Pretending to be talking to someone else, Maroni hears what Fish has to say. First she says that rumours of her death have been greatly exaggerated and also that Penguin has been playing Maroni the whole time as he’s been Falcone’s man from day 1. Fish even asks Maroni if he ever was suspicious of anything the Penguin has done that he easily explained away. Maroni starts to see the Penguin in a new light and after getting off the phone, tells the Penguin they are taking a road trip to meet a guy about a thing. When the arrive upstate, it is a cabin in the woods (which is never a good thing). Over breakfast of oatmeal and coffee, Maroni and Penguin talk about the deal he made with Falcone to spare his life and he also starts asking questions like what happened to Frankie as it seemed odd for him to be stabbed during a gun fight. The Penguin sort of explains it away but he gets a reprieve when Maroni goes out to gather firewood. While he is doing that, Penguin grabs the gun that Maroni brought and stuffs it in his pants when he returns. The two then have a talk and play a game of sharing secrets. The end result is Maroni saying that Fish called to say that the Penguin is Falcone’s man. The Penguin gets a bit nervous and tries to deny that he is working for Falcone but something Maroni’s says sets Penguin off and he pulls Maroni’s gun out. Whem Maroni says it is filled with blanks, Penguin doesn’t believe him and shoots several times. It is indeed blanks and Maroni knocks him out. When the Penguin comes to, they are in a scrap yard and Maroni forces the Penguin to go into a car that is about the compacted. Penguin tries everything to get his life spared like saying there is more to Indian Hill and Arkham than there is. Maroni is unmoved and plans to send the crushed car back to Falcone. The Penguin does eventually get out of the car just as it is about to be crushed by calling the owner of the salvage yard to say that Falcone will kill him and his family unless he stops. The guy stops and the Penguin escapes. The next morning he is found asleep under a bridge by a group of church ladies who offer the Penguin a lift on their church bus. Nygma is performing forensic at the crime of the week (more on that later) where he found something on the body that he wants to examine further. But Captain Essen says that is the ME’s job and tells him to stay away. Unfortunately, Nygma can’t help himself and starts to examine the body and just as he finds something, the ME comes in with Essen and she is forced to suspend and Nygma is unable to tell them what he found. Nygma goes to visit Miss. Kringle to say that he has been suspended and won’t be seeing him for a while but before he goes, he wants to return the pencil he borrowed. When we see the pencil, it is down to a stub. But to get back at the ME, Nygma breaks into his locker to stuff body parts in it and when the ME opens his locker, fellow police officer catch him with the body parts. The ME gets fired and Nygma is reinstated and tells Miss Kringle so, which she demands another pencil from him. I call this section “The Rise of the Riddler” as we see Nygma not being appreciated (except for Gordon) at what he can do and being ignored by the girl he likes. Something is about the snap with him. The episode opens with Dr. Crane dangling then hanging his victim over a building but before doing it, Dr. Crane takes a listen to his elevated heart beat. Bullock, Essen and Nygma as at the crime scene investigating. Essen warns Bullock not to stand too close to the building’s edge as she fears retaliation for arresting Flask. Bullock isn’t bothered by it. As the investigation continues. Bullock is visited by Scottie Mullens, whose number was found on the victim. Scottie was the victim’s sponsor of a fear group. Bullock is about to make fun of it when Scottie stops him. It is clear that Bullock is smitten with Scottie and makes thinly veiled attempts to ask her out under the guise of helping out a police investigation. Gordon tells Bullock that the traced where the chair that their victim was placed was made from. Bullock thinks that is a solid lead and leaves to investigate. Gordon doesn’t think it is a lead at all but goes anyway. We later see Dr. Crane gets his next victim, who has a fear of pigs. When Bullock and Gordon arrive at the warehouse, the two talk about their love lives like how Gordon has moved on from Barbara with Leslie and that Bullock clearly has a thing for Scottie. When they hear some noise, the two investigate and find the victim tied to a chair unconscious with two pigs around him and a big burly man in a pig’s mask about to cleaver him. Gordon and Bullock shoot the guy dead and their victim is safe. Back at the precinct, Bullock tells Essen that they got their guy and is going to the fear support group to tell them that they are safe now. Gordon doesn’t think it is over and wants to see what Nygma found about the body but Essen tells him that he’s suspended. Gordon doesn’t want to talk to the ME as he thinks he is incompetent while Nygma knows his stuff. So instead, Gordon meets up with Leslie at a bar to ask her about the case. Unfortunately, Leslie thought it was a date and looks a bit crestfallen. Gordon realizes hi mistake and apologizes and says he is a little bit rusty at the whole dating thing. Leslie isn’t really that bothered by it and actually wants to help Gordon. But their date is interrupted when Gordon gets a call saying the victim has woken up and he leaves but before doing so kisses Leslie while she stays and goes over the file. Gordon tells Essen that the victim was kidnapped by two men so one is at large. Gordon leaves a message on Bullock’s phone to say the fear group is not safe. And that is where Bullock is. Scottie shares with Bullock that she is scared of swimming pools while he shares that he is scared all the time. Before the meeting starts, Bullock meets Todd aka Dr. Crane, a regular of the group. Bullock starts first to say that he fears dying alone in a dark dingy alley instead of in a warm bed in the arms of a beautiful women (saying this while looking right at Scottie). It is Crane’s turn who becomes increasingly upset at talking about his fear failure and passing it along to his son. Crane get’s so upset that he leaves with Scottie following him. Bullock notices that they’ve been gone a long time and he realizes that Crane has kidnapped Scottie. Thanks to a tip from Scottie’s mom, Bullock and Gordon know what pool Crane has taken Scottie. At the pool, Crane is measuring Scottie fear level and does a good job at increasing it. Jonathan Crane comes in the pool to say that the meter has run out and looks a bit concerned at what his dad is doing. Crane tells his son what they are doing is for the greater good and gives him money to feed the meter. After Jonathan leaves, Crane pushes Scottie into the pool who then starts to sink to the bottom. Bullock and Gordon arrive with the former saving Scottie and the latter trying to get Crane, escapes. Back at the precinct, Leslie shares what she found from the file. Crane took the first victim’s adrenal gland or the fear gland to extract to cortisol in it that was elicited at the time of death. Both wonder what Crane is going to do with all that cortisol. And since the ME is now fired, Gordon mentions there is an opening now that the Gotham City Police and wonders if Leslie is interested in the job so she can get out of Arkham. Gordon wants to talk over this potential job over dinner. Leslie is sarcastically impressed at his transition. Gordon then says he wants to kiss Leslie but doesn’t want to in front of the precinct as he doesn’t want to hurt his rep. Leslie counts to three and when she leans in, wants him to kiss her cheek but instead the two kiss passionately. Fish seems to have procured the services of a pleasure boat but just when she think she is safe, machine gun fire is heard and the captain and crew are killed. When a really menacing looking man with a belt of bullets over his shoulder enter Fish’s cabin, the two stare down as it was Mortal Kombat game as the prepare to FIGHT. And the episode ends. So who sent the crew to kills Fish? And what will make Nygma finally snap and become the Riddler full-time? Let’s see what part 2 will bring next week.